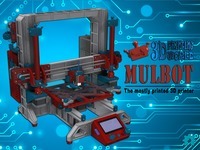 D-Bot HP Stream 7 Mount by Jays3DAdventure is licensed under the Creative Commons - Attribution - Share Alike license. Say thanks by giving Jays3DAdventure a tip and help them continue to share amazing Things with the Thingiverse community. Say thanks and help Jays3DAdventure continue to share amazing Things with the Thingiverse community. You'll need a PayPal account to tip Jays3DAdventure. Click the button below and you will be redirected to PayPal. Once the payment is complete, you'll be brought back to Thingiverse.